I wanted to update you all on some things since it’s been a while since I’ve posted. After my dad got sick in March, I knew I wasn’t going to have time to focus on supporting students for two websites. PSP was my main focus, and I also have a private student group to support. So I decided to set the 2Create courses to “private” to prevent new students from enrolling. Then once things returned to normal in my personal life, I had to be honest with myself. I wasn’t doing much with website building or marketing, other than passively using my podcast to promote PSP courses. I’m making waaaaay more money selling my T-shirt designs than I am with the actual courses that teach what I’m doing. I’ve had about 500 students enroll in my PSP courses. While that’s not bad, it could have been so much better if I did more marketing. I’ve never been comfortable or efficient with marketing my products. It intimidates me. That’s one business hump I’ve never been able to get over. I admire people who are diligent with tracking email campaigns and conversions. It all just makes my head spin. For a long time, affiliate marketing and AdSense were my favorite and most rewarding ways to earn online. However, POD now holds that top spot. I don’t come from a design background so I’ve had to learn a lot. When I worked as an HTML Analyst for American Airlines over 10 years ago, my team lead forced us to use Photoshop, but the company provided us ZERO training. I never actually learned much about Photoshop until I quit my full-time job in 2006 to work on this site. Fast forward 12 years later, I’m now using Photoshop and Illustrator to create some very detailed art that I never thought I would be able to do. It also goes to show anyone can do this regardless of your design background. I have one T-shirt that has netted over $20,000 in royalties. Yes, from ONE T-shirt design! With all the income potential, print on Demand is not for everyone. Just like anything else, don’t get into this just because you are in desperate need of money. You need the desire to learn the POD business and even something about software if you want to scale your income. And for long-term success, you should be thinking of building a brand instead of relying on passive traffic and income like I’ve been. Even if you’re a talented designer, you will quickly learn that’s just the beginning. You also have to understand keywords and find niches to design for. It’s getting very competitive, so make sure you jump in for the right reasons. If I’m honest, I was drawn to this venture for the money, but I’ve STAYED because of my love for the work. When my dad was sick, I was super stressed. I found the creation process to be therapeutic. A lot of my success has come because of creative ideas that just haven’t been done, and the creative work is what makes this fun for me. On the flip side, you also have to be prepared for theft. That’s been the biggest disappointment of this whole experience. It’s why I use an alias for my POD accounts, and don’t share much of my work. As a result of Amazon and other PODs not protecting our work with a wrinkle or watermark, my images have been stolen and re-uploaded to numerous sites. Up until now, most of my designs have been created through shapes in software. Believe me. You can do a lot with this. That’s what I teach in my PSP Photoshop course. Now I’m doing this more with Illustrator as I improve. However, I wanted to learn how to draw free hand. So I enrolled in an art class. We’re learning some basic drawing principles and how to shade using graphite, charcoal, and colored pencils. 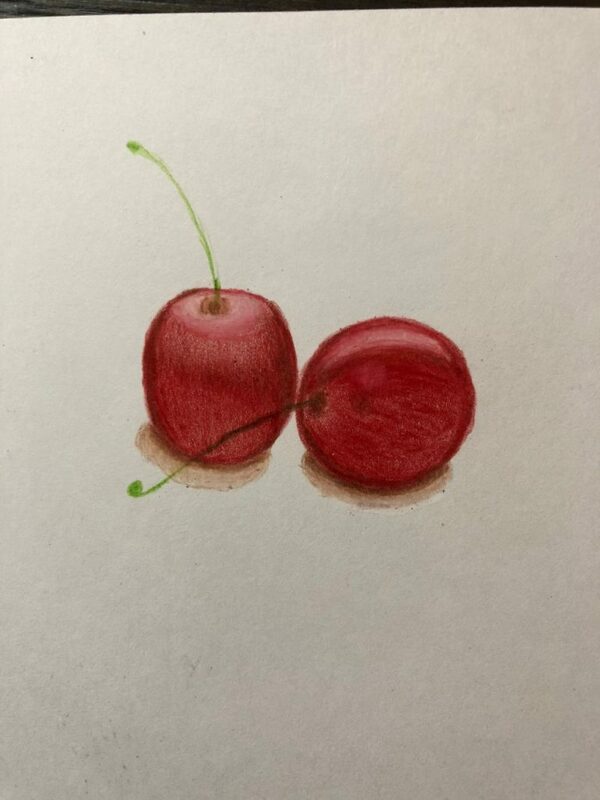 Here are some cherries I drew with colored pencils. I was pretty proud of this because I was struggling with shading earlier in the semester. So as you can see, I am now knee-deep in learning about drawing and T-shirt design. It has been a nice change of pace. Anywho, I know most of you did not subscribe for all this print on demand stuff. That’s why I haven’t been blogging much. I didn’t have anything noteworthy to share in this space. 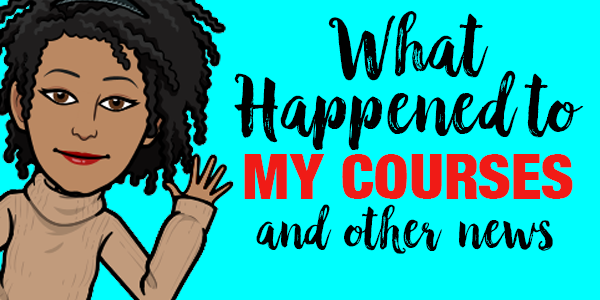 However, I wanted to update you on why I took down my 2Create courses since many have asked. Those who have enrolled can still access them, but I have no plans to enable them for new students any time soon. I DO plan to make updates for the existing students, however. By the way, my dad is doing great! He is walking again, and his ankles are doing well considering how severely he injured them. Other than some initial stiffness when he first stands up, he’s walking well now! We feel so blessed and lucky he came through all that. Thanks to all who reached out to inquire about his health. I really appreciate it! Hope you’re doing well! Drop me a line below and let me know what’s up with you! What’s good, Lisa? Hope you’ve been well. Felt like checking out your blog tonight. Glad I read your post. Hope your dad is doing well. As we get older, real life increases. That said, it’s good to see you’re still posting. You’ve touched a lot of people throughout the years. Never thought eight to nine years ago I’d stumble across 2Create and I’d still be coming back. It’s the only site I’ve ever returned to for this long. Have a good one. Wow Clay! Thanks for coming back to check in on the blog! I’m back on this blog after a long time, and luckily saw this particular one. It’s nice to see that i am not the only one who skipped what i was doing for quite long time. I was in hosting business which i started with resellerclub earlier in 2011, But it wasn’t my cup of tea and started learning clay art. Today, i am happy with what i have achieved so far with my Clay art sale numbers in etsy. God bless to your father. Nice to see you …Glad your father is up and mobile in a good way. Your updates speaks volume and I find your information so helpful, informative in staying abreast with tools to use in reference workings of my online web-sites. keep up this good impact you make along the way. Great that you write the true. It is the best hint to show, that real money can also be erned outside of blogging (virtual good) by selling T-Shirts (real good). As for me I will continue to blog and put out quality content. I’m not at the point where I will get involved in print on demand. Nice to see after long time. Wow POD’s demand came to know by proof of your picture loyality ($ 20,000 ). My best wishes to go and touch new mile stones your work. Missed you Lisa. I pray your Dad has a full recovery really soon. I have experience with sick siblings over the years and I know how the time and effort you put in are always outweighed by love. I’m sure that he is so proud of his amazing communicator daughter. On another subject, I have two questions: (1) Are your classes permanently closed to new students? and (2) Can you help me promote my Spreadshirt Tee Shirt shop? I think I’ve got some good designs (I use PhotoShop, Illustrator and AffinityDesigner). But I just cannot get past the design stage to show off the shirts to potential buyers. I’m open to any suggestions that you are kind enough to offer. Thank you for your update. So glad your dad is on the mend. I too am learning to draw and paint and am loving it, it’s quite time consuming and can quite easily take over. Nice to see you …Glade your father is up and mobile in a good way. Your updates speaks volume and I find your information so helpful and informative in staying abreast with tools to use in reference workings of my online sites. keep up the good impact you make along the way. SOOOOO happy your dad is feeling much better and things are getting back to normal for you! Cheers to doing what’s best for you and killing it ? PS. Miss Website Babble but I know you had to move on. Yes, Website Babble became a pain in the you-know-what. It was more work than it was worth. I do miss the community but I have my student group now and I’ve been enjoying it as well. I like having a smaller, controlled community. It’s less intimidating for the students who have questions and it’s a friendly bunch. But I do miss chatting with the WB group. When our queen sends out a raven…we must stop what we are doing and read. Great that your dad is doing well Lisa…and, “one T-shirt that has netted over $20,000 in royalties” jeepers, hmm, should I consider giving up everything and taking this on full time to find my holy grail design haha, that is crazy. In what amount of time if you don’t mind me asking? “When our queen sends out a raven” LOL! You are hilarious, Stephen! It was over the course of a year or so. I uploaded the design in 2017. In the competitive state of Merch, I highly doubt I could do that again with just organic traffic. I’m glad that your father is improving. It’s great that you were able to spend time with him when he needed you most. You showed me how to get started with my website. I am looking forward to learning how to get some traffic and start making progress with it. Thank you for all your encouragement. First, I’m glad your dad is doing better. I’m visiting mine as I write this and nothing compares to spending time with family. Second, your evolution is natural. Finally attracting the business model that is most rewarding. I am so happy for you and I know you will continue to grow and evolve. Just keep in touch with us! Would you recommend to keep trying to make a perfect print or should I change my tactics? I would definitely keep trying. Have you done any research to see what kind of tees people in your audience buys? Some audiences are hotter than others when it comes to tees. Since you said your audience is “thematic” I’m assuming they all have something in common so that’s good. Now it’s about experimenting and finding out what they want on a shirt. You could even post some design ideas and ask your FB followers which designs they like best. That’s a great way to see if someone would be interested. Thanks for following and your support! Sorry for you father. Hope he will be much better . You don’t know who i’m, but i can say that i follow your website since 2012 i think. I’m from the other side of the world. I’m from Tunisia and i confirm that your wrinting style touch many people like me from different cultures. Please keep going and and stay strong. Tunisia! Wow! Glad to meet you Eve and thanks for reading! But we want you to create podcasts about this website and other types of incomes such as Affiliate Marketing, Website design, and Tool recommendations. I now us Thinkific because of you. I definitely plan on it! I just haven’t been doing anything new other than what I’ve already talked about. But yes, that is the goal. For example, I made a decision to only podcast to promote the courses and I can do a post sharing how that went. So yes, that’s the plan when I have more to share. So glad to hear your father is doing well, especially with the holidays approaching no one wants to be layed up and not able to enjoy themselves. Sorry to hear you’ll be doing less with websites but considering your success with POD it’s fully understandable. At any rate all the best to you and your family and blessing for the months ahead! Thank you Tony! I’ll still be updating here from time to time when I have new things to share about PSP. Just maybe not as often as before. I just don’t need to be selling courses on something I’m not focusing as much on right now. “I’ve never been comfortable or efficient with marketing my products. It intimidates me. That’s one business hump I’ve never been able to get over. LOL! Lisa, I’ve always admired your success and how you’ve gone your own way when it comes to starting and growing your business. At times when you’re a newbie or seasoned in this game of making money online, you tend to go the way the wind blows and hit at whatever is working. But the reality is that what works for some, doesn’t always work for others. I believe a good portion of that success comes from knowing who you are, what you’re good at, what truly interests you and what it is you shouldn’t bother with. I’ve learned so much from you over the years, but I think your honesty and uniqueness in your business development is the most important lesson thus far! Continued success my friend and continued blessings for your father. Thank you sooooooooooo much Cynthia! I really appreciate your long-time support of my blog and courses. Oh yes, I have gotten REAL good at knowing what I need to leave alone. LOL Thank you, thank you for your support and kind words! It’s very humbling. Glad you and yours are doing great. I will hit that Link and see your new Ideas. Be safe. I’m glad to hear your Dad is doing well! POD or SEO or SEM don’t matter, as long you are flexing your entrepreneurial muscle it’s all gravy. Keep keeping on Lisa! Ha ha! Yes, so true. Thank you! Hi, Lisa really great to hear from you after such a long time. I didn’t realize that your dad had suffered an injury, but it is great to hear that he has had a very good recovery. It is also good to see that you are back out again sharing your great knowledge. As much as I know that this course would be good for me, at this time I have to take a raincheck. Yes we almost lost him to a severe kidney infection in March. He had a heart attack because of the infection, fell during the sickness and broke both of his ankles. So I spent a good two months in St. Louis with the fam and helped nurse him back to health. Thanks for the best wishes! But great that he and you have come through this challenging time and hope that your business goes from strength to strength. Thinking of you and looking forward to hearing your progress from here onwards. Always good to hear from you Lisa and great to hear that your dad is doing well. And no worries about changing your direction from time to time as you press on toward the mark. A great NFL team getting thumped during the first half always makes adjustments for the second half.. And even if they go into the half winning, they will still make small adjustments to solidify their position. In a way, that’s what you are doing. from you Lisa. You are truly and inspiration. Good news Lisa–I assume that “life returned to normal” means that your dad is recovered. Happy to hear that. The rest–like the evolution of your business focus and interests–I think it’s all a part of life. It’s what we do (or should do)–change and adapt. That is probably more necessary in current times with the changing winds of the economy. Whichever way you move I wish you the best. Yes, his health has been good for some time but it took him a long time to walk again… almost 3 months in a wheelchair. But yes, he’s back on his feet. Literally! lol Thank you! Thanks for the update! So glad your Dad is doing well! So happy to hear from you again! I missed you! And it’s great to hear that your dad is recovering. Warmest wishes to your family! I lost my mum to cancer this year and I have not been able to do anything in my business for awhile. I’m trying to pull myself back together. I hope to be able to build some passive income streams eventually so that I can be with my family when then need me the most. You are such an inspiration to me! I’m so sorry to hear that Nata! I cannot imagine what you must be going through. Prayers and blessings to you. The online world isn’t going anywhere and will be here when you’re ready to jump back in. Take your time. Excellent outcome for Poppa! He raised a great communicator! Your true spirit pops out in every post. You cast your wisdom to a wide circle. To be able to receive your words: a blessing! Will try to ‘give forward’ to my circle. Thank-you! Glad your Dad is better. Thank you for the update. I’ve missed your posts. As with the Entrepreneurial–when you work on building your knowledge, you find out other information in your journey. Somewhere in your journey, you found it more lucrative to do what you started out doing and made the transition. Yes, it is heart breaking that you have to let some of your follower of one product go as you increase your follows onto your new venture; it’s sad but it’s a process. And, most of all, you have to be true to you. Good luck in your continued growth as an entrepreneur. And I think that’s the hardest part with all this. I do feel like I’m abandoning a good portion of my followers, but I have to do what serves me best and realize I can’t please everyone. Like you said, I have to be true to me. So thank you for that. I have access to over 10,000 Jazz albums going back to to the Victrolia ( 1930’s 1940’s , most of the cover art is way past its Copy Right. I want to create a business using album cover pictures. Aall the albums and covers are in pristine museum like quality. The person who owns the albums , a real Jazz historian also has a very very detailed database on each album, song, and the each of the artists. There has to be a way to capitalize on this resource ( t-shirts, mugs, etc. ). I have a decent Photoshop background and a high end Cannon camera, However, I need advice and where do I start to monetize this opportunity? As long as you are sure on the copyrights being expired, then yes, you can. There are many ways to approach this. One way is to take pictures of the albums and scan them into software. You turn the album covers into a vector file. This is a file that is created in Adobe Illustrator or Affinity Designer (any vector software). A vector file lets you enlarge it with no loss in quality so it’s not pixelated. So you can either do this yourself or take the albums to a digital printer and tell them you want vector files of the covers. That might be the easiest if you don’t want to do it all yourself. Once you have the vector file you can now upload to any POD or send them to a local printer for making tees. One thing I always remember you for is your ability to adapt and try new income streams. Glad that your father is doing better now and things are getting back to normal for you. My name is Sonya Walker and I use to be a client of yours. Thanks to you, I learned a lot about building a website. A few years ago I use to get so excited to watch your videos on Youtube on how to build a website. I eventually built one and your web hosting company hosted my website (“I”m Gonna Do It Myself). I loved going through the process and learning from you. I no longer have that site, but the reason that I wanted to build it is to help other visual artists along the way on their journey to success. Yes, I am a visual artist, but I had not yet mastered being a successful artist and there I was trying to give advice to others. Well I am still on that journey, but I have done a lot of things in the process. One thing was putting my images on t-shirts, but not through prints on demand, but through printing them myself. Nevertheless, I just wanted to reach out to you in response to your email and to say thank you for being an example of a strong woman that has her stuff together and is an example for others who want to work for themselves. By the way, you can check out some of my work by visiting my website, http://www.sonyawalkercreations.com. Continue to be who you are and much continues success. Really appreciate your kind words, Sonya. I love hearing how people have used my tips to build their sites so thank you for sharing that story. It’s Jack!! Great to hear from you! How is the hosting biz going? You still at it? Glad to hear your Dad is better now. I’m still in the hosting business but my main focus is and has been premium website templates/Wordpress themes for the last few years. Everything is going well. I purchased a house at the start of the year and it needed to be stripped out completely (pulling all of the old plaster off the walls, all the old ceilings down etc) so I worked on that for a few months learning everything from Youtube. I’ve now moved in and its back to focusing on my business.